Rockwall Metal Roofing is ready and waiting for your call! Need Fascia Installed or Repaired? We know what we are doing and can come give you a NO Obligation, FREE Estimate! Fascia is the long thin board that covers the area where a wall joins the roof. Fascia can be a flat piece used as molding; or a horizontal piece covering the joint between the top of a wall and the projecting eaves. The Fascia can be damaged by a many number of things. Water damage from Faulty Gutters can damage the Fascia. Animals such as squirrels, birds and raccoon love to nest in Fascia and will exploit any weak spot that allows them access. When you clean your gutters, take a look at your Fascia and see if you can spot any damage. Don't ignore any damage found. It will only get worse! Give us a call and let us see what we can do to help you! Can't get a clear view? Give us a call and we can come inspect them for you! You don't want to leave them to continue to rot! We are more than happy to help you out and check them to see if they can be repaired or if they need to be replaced. We don't want you to have any surprise costs, so we are very thorough in our inspections! 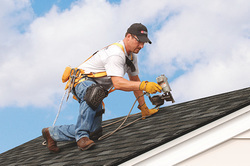 We know what home repairs can cost, so we are highly competitive in our prices. Call NOW or Complete the Form to the Right and we will get back to you As Soon As Possible!